Mumbai, Nov 10 (IANS) Choreographer-turned-director Ahmad Khan says he can't thank his friend Shahid Kapoor enough for fulfilling a long-cherished dream of his children. "I had been promising my two sons Azaan and Subhan a trip to Disneyland for months. Earlier, when we shot in the US for Yash Raj Films' 'Bachna Ae Haseeno', I kept hoping there would be time. But I couldn't manage to get away. But this time Shahid made sure it happened," Khan, who is back from the US after shooting for a song with his best friend Shahid, told IANS. Shahid not only ensured that Ahmad wrapped up his work as quickly as possible, he made all the arrangements for his friend, his wife Saira and two sons to take off for Disneyland. "And why not?" said Khan defensively. 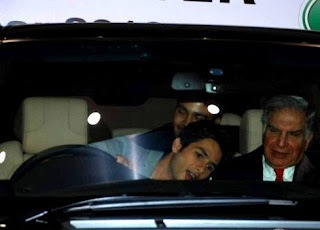 "Shahid and I are childhood friends. Before my mother held my sons, Shahid took them in his arms. So it's perfectly natural for him to look out for me and my family. "Out of the one month I spent in the US only 12 days were devoted to shooting the song. It wasn't even a dance song. It was a concept number showing the hero and his friends splurging and bingeing all over the US. 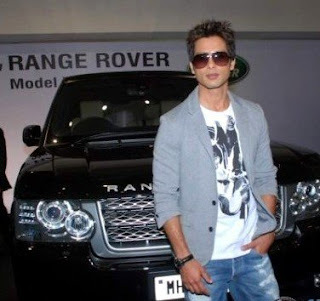 "We shot at casinos and at various pleasure and tourist spots in Philadelphia, Orlando, New York, New Jersey and Chicago," said Khan who choreographed Shahid in the recently hit song "Dhan te nan" from "Kaminey". 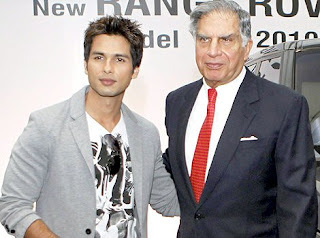 Shahid is also featuring in Khan's directorial debut "Pathshala". The first time director says that the actor's role is similar to Aamir Khan's in "Taare Zameen Par". 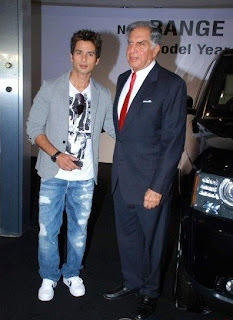 "In a two-hour long film, Shahid is there for an hour� he's there for 55 minutes. His role is like Aamir Khan's in 'Taare Zameen Par'. He comes in mid-way and yes, he's the teacher. 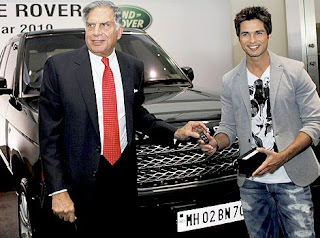 Both Shahid and I have decided to focus on the kids in the marketing rather than on Shahid." Actors Priyanka Chopra and Shahid Kapoor bagged the Teacher Achievement Awards while noted lyricist Gulzar was bestowed the lifetime achievement honour at a function in Mumbai. Priyanka, who bagged the award in the entertainment category at an event on Saturday night, dedicated the award to her mother. "I am thankful to the jury. 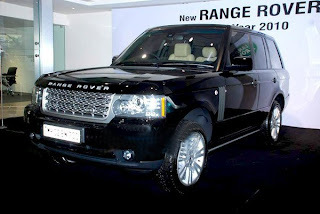 Whenever I get a prize, I think this would not have been possible without the constant support of my parents," she said. 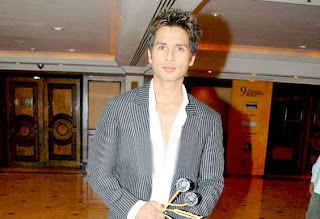 Shahid was conferred the Teacher's People Magazine Achiever award. "I feel special. 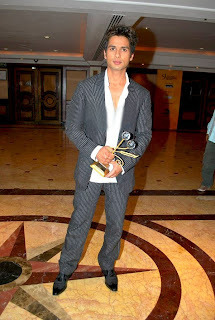 It's really a big achievement when such an eminent set of jury has decided to give me the award," Shahid told IANS. Filmmaker-poet Gulzar was modest when given the Lifetime Achievement of the Year award. "I don't know what I have done so special. 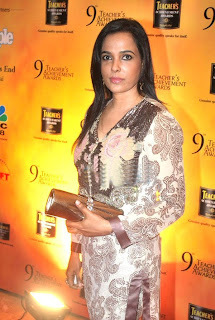 It's you, the people, (who) make me realise that I have made some contribution to the Indian film industry. I am thankful for that," he said. Leading advertising photographer Iqbal K. Mohammad got the award in the communication-photography category and Saina Nehwal, the first Indian to win World Junior Badminton Championship was given the achievement award in sports. 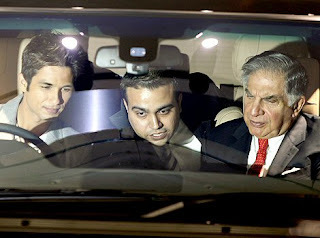 "We are hopeful that each edition of the Teacher's Achievement Awards shall inspire and encourage people from all walks of life to strive for accomplishment, that not just add to individual glory but also propel societal growth and well-being," said Matt Shattock, president and CEO, Beam Global Spirit & Wine Inc.
Bollywood actor Shahid Kapoor and Tata Motors Chairman Ratan Tata listen in as a salesman shows them the features of a new Range Rover car gifted by Tata to Kapoor, at the Jaguar Range Rover showroom in Mumbai. 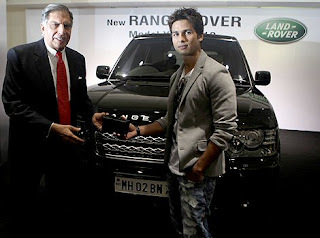 Tata Motors Chairman Ratan Tata hands over the keys of a Range Rover car to Bollywood actor Shahid Kapur at the Jaguar Range Rover showroom in Mumbai.